We first encountered SRM Tech when the company sent its Arezzo deck in for review. 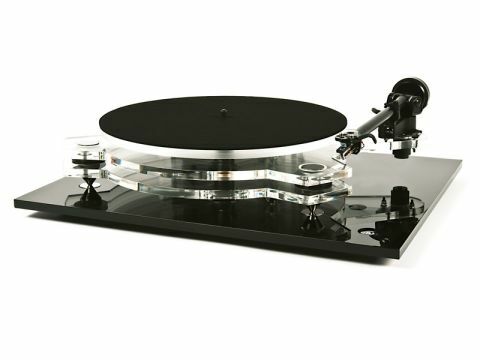 It won a Best Buy Award and went on to win Best Turntable up to £1,000 in our 2009 Awards issue. The new Athena turntable tested here is also built from transparent acrylic and has seen a number of revisions in recent times. This attractive turntable is very well finished and comes complete with a modified Rega RB251 arm for a very competitive price considering its handmade nature. The Athena is made from a slab of 10mm acrylic that sits on three spiked feet and holds the motor and three Sorbothane isolators, these support the top slab which incorporates the platter bearing and tonearm. It's a simple, but well conceived design that uses the resonance-damping properties of acrylic and Sorbothane to minimise energy transfer from the supporting surface to the platter. The platter is 10mm acrylic and this sits on a damping layer, then a vinyl polymer subplatter, which is driven by twin belts from an aluminium pulley. Putting the belts on is a little fiddly and this would make changing speed a bit slow but it's an interesting approach. Another unusual feature is that the on/off switch is a separate item that links to a wall-wart power supply and the motor via fairly long cables – you could almost put the switch a couple of metres from the deck if you wanted. The EL-1 arm has three small mods: the counterweight has a ring of synthetic polymer to dampen it; the counterweight stub is filled with sorbothane and the finger-lift on the headshell has a shrink fit covering for a bit more damping. This is a well-built and finished turntable for the asking price; the polished chrome spikes and top caps, plus the decent-quality motor and bearing all confer a degree of confidence in its reliability and longevity. The free range on/off switching is a little untidy, but doesn't slide around as you might expect and if you add the Athena Isolation Platform (£69), it can sit underneath this and the wires won't show. This platform is very good value and its polished black form looks great under the turntable. The EL-1 arm mods are simple and, in the case of the polymer ring, a little inelegant but undoubtedly worthwhile. All-in-all it adds up to a competitive package that should hold its own against the big names in the budget turntable market. All that resonance damping pays off with a calm and resolute sound that's almost at odds with the turntable's light weight and physical transparency. One tends to expect lighter turntables to have a busy, exciting if not necessarily relaxed sound, but the Athena is commendably even-handed. It's particularly strong on texture, which to an extent is because there is an emphasis on the midband. Adding the Isolation Platform goes a long way to addressing this by beefing up the bass and adding real gravitas, the mid also improves thanks to stronger contrast and better dynamics. We were pleasantly surprised by the Athena, it has an assurance that belies its appearance and a degree of detail resolution that puts it among the front-runners in this price range. There is a hint of the acrylic sound in its balance, but less so than with many alternatives thanks to the careful use of damping. It times well, too and can reproduce the scale of a recording with little difficulty. This keenly priced Athena should do a lot to establish the company in the turntable market, because it looks and sounds remarkably good for the money.